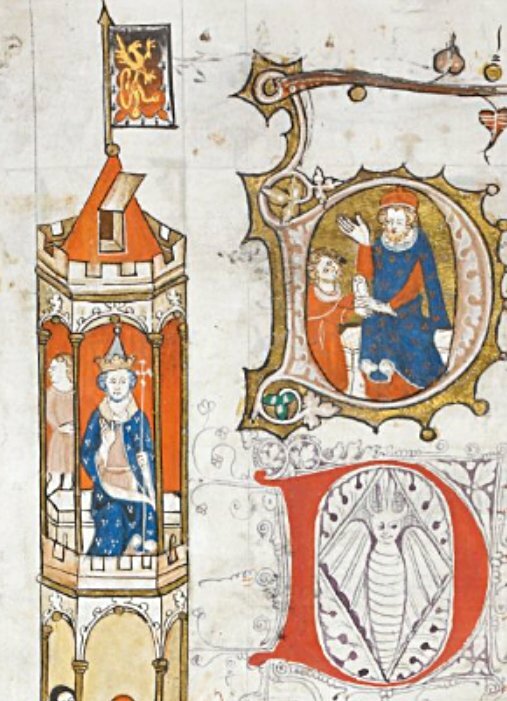 The Smithfield Decretals (British Library, Royal MS. 10 E.iv) is an exceptionally large (c.450 x 285mm.) 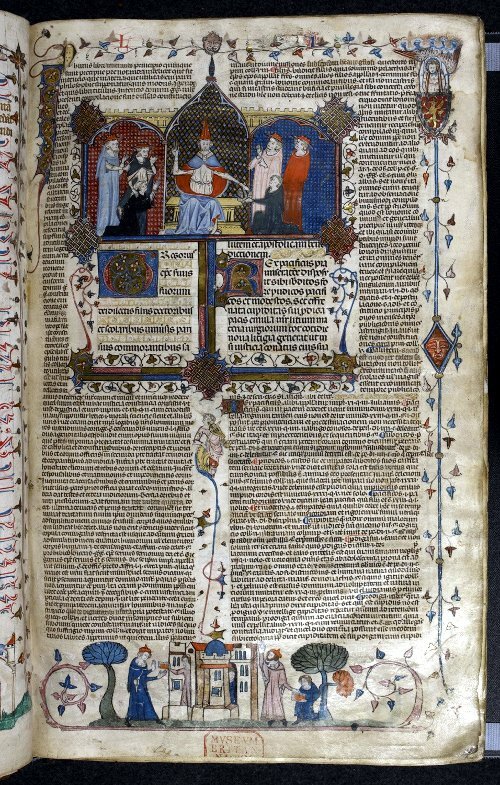 and lavish (including more than 600 narrative bas-de-page scenes) copy of the Decretals of Gregory IX with the gloss of Bernard of Parma, thought to have been written in southern France c.1300, with decoration and an extra prefatory quire added in England some decades later. The BL website has an online description with partial digitization and a description with full digitization. The main reason I found fault with a recent monograph on the Taymouth Hours is that it tends to treat hypotheses as facts. One of several such hypotheses is the proposal that the Smithfield Decretals was made for man called John Batayle who was a canon of St Bartolomew's, Smithfield, in the last quarter of the 14th century. This may be true, or it may not. "Liber domus sancti bartholomei in smythfylde" (the "No 1059" is an Old Royal Library number, and the "10.E.iv / p.185" refers to the British Museum shelfmark and catalogue page number). The proposal that the book belonged to John Batayle derives from Alixe Bovey, 'A Pictorial Ex libris in the Smithfield Decretals: John Batayle, Canon of St Bartholomew’s, and his Illuminated Law Book', in Decoration and Illustration in Medieval English Manuscripts, English Manuscript Studies, 10, ed. by A.S.G. Edwards (London, British Library, 2002), pp.60-82. 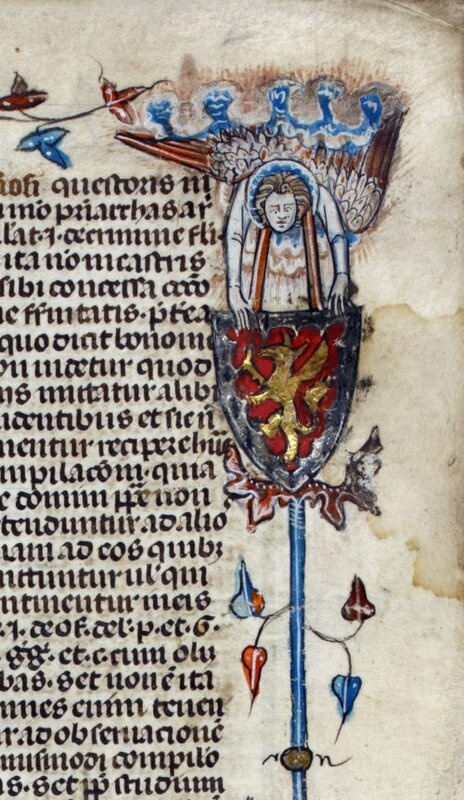 "In ‘A Pictorial Ex libris in the Smithfield Decretals: John Batayle, Canon of St Bartholomew’s, and his Illuminated Law Book’, Alixe Bovey reveals that a frequently occurring coat of arms can be identified as the arms of the Batayle/Bataile family, and proposes that a series of bas-de-page scenes may be interpreted as illustrating Batayle’s purchase of the volume. She has, however, missed a trick or two. First, in a large initial next to the first occurrence of the Bataile arms (pl. 1) is found what is presumably a deliberate rebus: a bat with outspread wings = Bat + aile (‘wing’ in French). 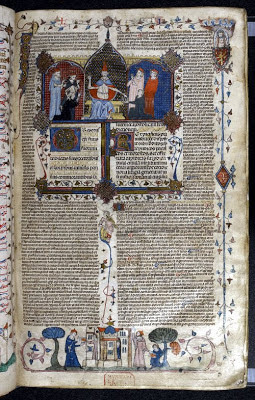 Second, the John Batayle singled out in the title occurs in documents of c. 1380, but the cartulary of the Hospital of St Bartholomew’s records many other earlier members of the family, three of whom occur c. 1330, much closer to the date of the manuscript (c. 1330–40); one of them is therefore more likely to be its first owner." The identification of the arms seems secure, and although Bovey was the first to publish the identification of the arms as belonging to the Batayle/Bataile/Bataille family, her endnote no. 9 suggests that the arms were in fact identified for her by Thomas Woodcock, Norroy and Ulster King of Arms, of the Royal College of Arms. "The lucky survival of two documents record that a man by the name of John Batayle was a canon of St Bartholomew's in the 1370s and '80s. His name appears on a clerical subsidy roll of 1379 ... Canon Batayle is also named in a will of 1382, made by another member of the community of St Bartolomew's ..."
According to Bovey (and by general consensus), "Copied on the Continent ... by about 1340 the manuscript was in England". It was in England that it received an extra quire of text and decoration, including the Batayle arms. 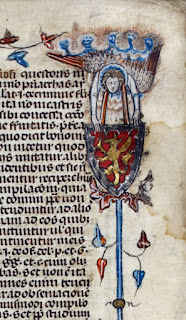 A book of decretals would have been of no practical use to its owner unless he had undertaken study of Canon Law at university, so its first owner is unlikely to have been younger than about 20 years old in 1340. We may thus estimate that he was born in 1320 or earlier. Indeed, we might reasonably expect that only a considerably older man, well established in his legal career, would have been able to afford such a book. The John Batayle to whom Bovey attributes ownership of the manuscript became and acolyte in 1370 and was still alive in 1382 when, if he had been born by 1320, he would presumably have been at least 62 years old. This hypothesis is plausible, and one could imagine a man born in 1320 having a career as a lawyer from about 1340 to 1370 before deciding to spend the rest of his life in the service of god. But "plausible" is not the same thing as "probable", and is certainly not the same thing as a fact. As indicated in my book-review quoted above, the Cartulary of St Bartholomew's Hospital [Smithfield], Founded 1123, edited by Nellie J.M. Kerling (London, 1973), provides other candidates for the first Batayle owner of the manuscript. Various Batayles appear in documents of St Bartolomew's, Smithfield, from c.1190 onwards through the 13th century, and include "John de la Batayle, brother and heir of Richard de la Bataille, clerk" in 1329, 1330, 1336, and 1339. From a 1329 document we learn that Richard had been rector of Braham. It is possible that this John Batayle is the same man who became a priest in 1372. "To the treasurer and barons of the exchequer. Order to admit William Batail, as the attorney of Robert de Hambury, chamberlain of North Wales, to render his account at the exchequer at York, as Robert is charged with affairs by the king and his council"
A document dated 28 August 1340 is extremely similar: William Batail, attorney of Robert de Hambury, is attorned to render account in place of Robert. Thus at exactly the same period when the Smithfield Decretals is believed to have been lavishly decorated for a member of the Batayle family, we have records of a high-ranking lawyer called William Batayle. In contrast, we have no evidence that John Batayle, Canon of St Bartholomew’s, was wealthy or had any connection with the law.